Recently posted this on reddit, figured it could be useful one way or another here. Source code and contribution guide can be found here. Code was originally forked from here. The total image size is ~5.5 MB, so keep that in mind before you hit Select All. Let me know if you have any ideas for improvements, or make a pull request if you feel so inclined. Cheers. Looks pretty useful. I like it. Good job. Saddly i cant agree with any of these (mainly cause I haven’t played fire emblem 9/10) but nice job anyways. How dare you deny the true god of Tellius? 2 commits changed 77 files with 5 additions and 2 deletions. 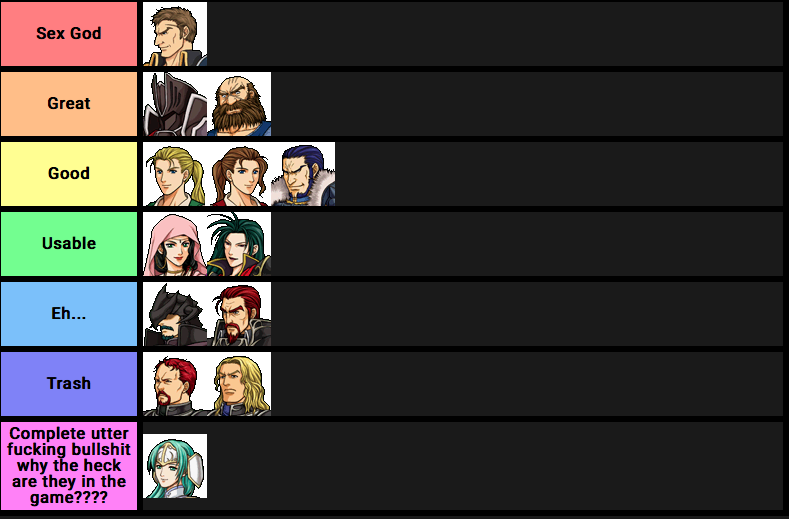 I sent in a PR for FE3 portraits. 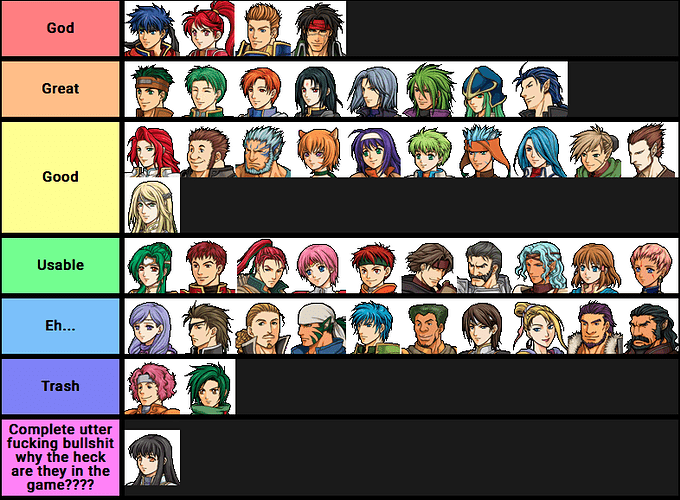 Speaking of ideas, going all the way back to 1990 and including FE1 and 2 would be cool. Might need to have pantsless Marth in a tierlist. also Berry Goodman and maybe some other extras from TMS. I just merged your PR in! Made a few changes afterward to preserve the “Game … Extra” layout. 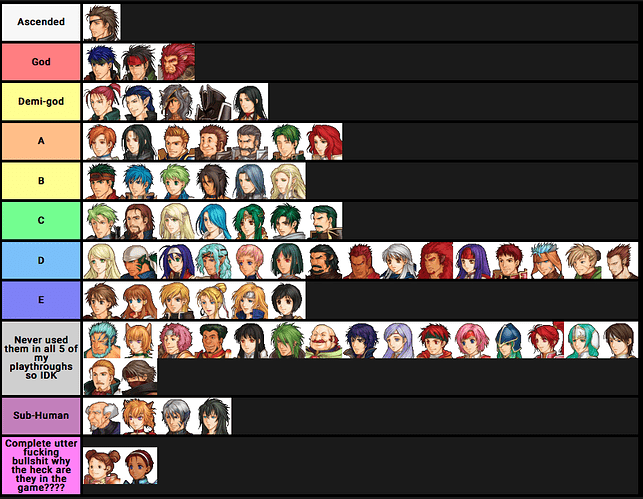 As for FE1/2 portraits, I do worry about making the list of games longer than it already is, especially for the remade games whose characters are already fully represented except for that one guy Berkut kicked out. Saving and loading is now available! Your code shouldn’t break in a future update, but you can keep a local copy of this project if you like by downloading the source code and any code you generate in there will always work there. You can now double-click instead of dragging to move someone to the highest available tier instantly.